Tower paddle boards shows photos of the Adventurer 9’10” iSUP getting run over by a car without sustaining any damage — we weren’t about to test this claim ourselves, but we can say that this well-constructed board definitely does inspire confidence. Just in case you’re still new to the idea of inflatable standup paddle boards (iSUPs) — don’t be fooled! These are not flimsy blow-up toys! These boards are fully viable alternatives to traditional hard SUPS — and they just happen to be super convenient as well! 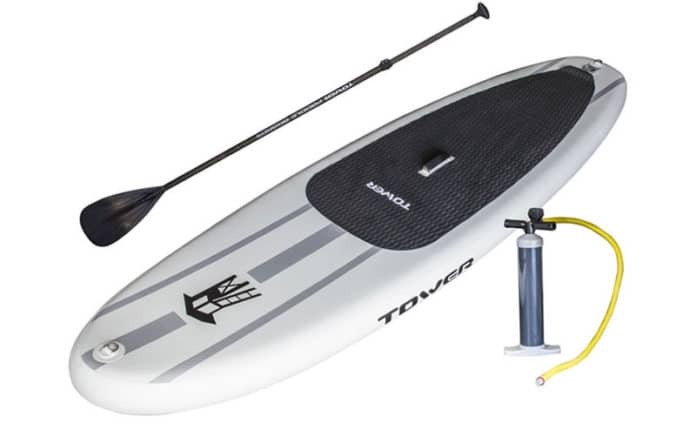 The Tower Adventurer, in particular, with its military-grade PVC, sturdy 6” thickness, and impressively smooth ride, sets the bar high for any sup (inflatable or not). We were pleased to find that the Tower Adventurer iSUP performs just as well as a hard board and it is SUPER durable. It’s a well-balanced board, perfect for beginners and performing up to expectations for more experienced paddlers as well. The Tower Adventurer has the perfect mix of balance/sturdiness along with excellent maneuverability for an easy, fun ride. 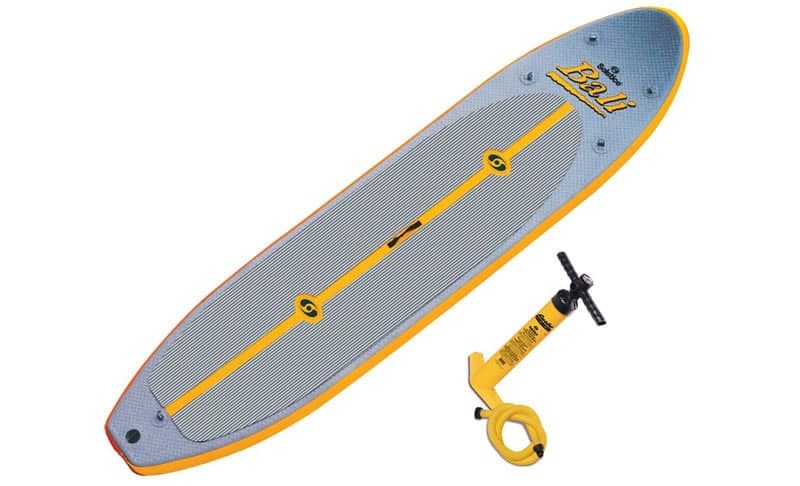 Includes fins, roll-up carrying strap, adjustable 3-piece paddle, and hand pump. D-rings for attaching a leash, water bottle, or any other gear. High-grip, comfortable surface, and excellent balance and maneuverability. 2-year warranty covering any defects or problems beyond normal wear and tear. Weight limit: 350 pounds.This board can hold a lot of weight! A lot of inflatable SUPs will have lower weight limits. Material: This board is made out of military-grade PVC with drop-stitch construction. Don’t think that this board is wimpy just because it’s inflatable — unlike hard stand up paddle boards, it’s not susceptible to dents and cracks. Impressive! Inflating: As advertised by Tower, this board can inflate up to 15 PSI, but works great at just 10 PSI. Set up: Set up for the Tower Adventurer iSUP is pretty minimal. Inflating with the included hand pump takes about 5-10 minutes, depending on your arm strength (and your conviction!). If you want, you can buy an automatic pump — but note you will have to buy an adapter to attach it. The only other setup required is attaching the center fin, for using the board in flat water. A few users have complained about the small hex screw, which would have to be replaced by the company if lost, but we weren’t too worried about that. Deflated and rolled up, this board can pretty easily fit into a large backpack. For a flight, throw it in a duffel bag with the paddle and pump and check it — or if you’re lucky you just might be able to cary it on. That definitely can’t be said for a hard SUP! Many riders have mentioned doing yoga on this board, and taking it out with multiple riders, or even their dogs! The Tower Adventurer iSUP also has a few well-placed d-rings, so you can attach anything you might need to bring out on the water — camera bag, backpack, water bottle… many riders even attach seats and set up fishing poles (why sit on the dock like a loser? Sit on the water!). Overall, this is truly a versatile board. It’s an easy, stable ride for beginners, but it’s quick enough to have some fun if you’re ready to tear around. At 350 pounds, the Tower Adventurer has an unusually high weight limit. Bring a friend on board with you, or bring your dog, or both! 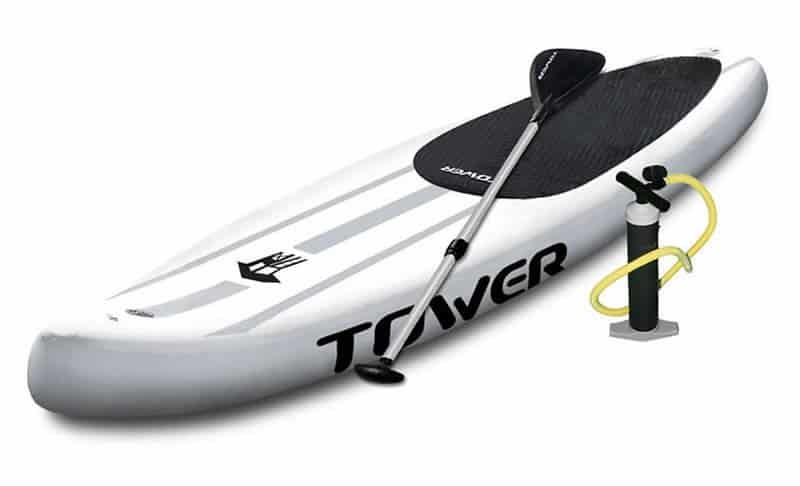 To wrap it up, the Tower Adventurer 9’10” iSUP will be a good fit for you if you’re looking for something with the convenience of an inflatable board without compromising on the quality of the ride or the materials. Of course, any inflatable board is going to be somewhat slower than a traditional, solid SUP. Which board you choose is a matter of personal preference — experienced riders may still prefer a solid board, but ISUPs like this one offer convenience and portability, and are quickly closing the gap in quality and rideability. Many riders may not even be able to tell the difference between the Tower Adventurer and a traditional hard board, and that’s a testament to its fine quality. 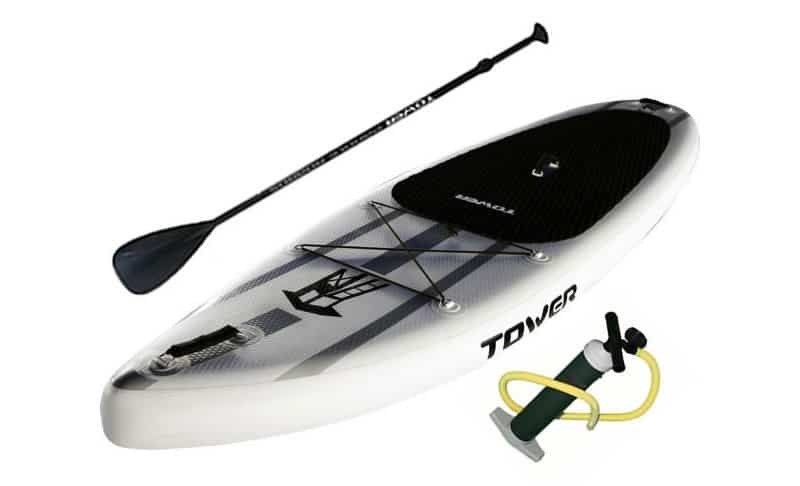 Did you try the Tower Adventurer 9’10” yet? Let us know what you think about this amazing board! We love hearing your experiences in the comment section below. The Tower Adventurer has the perfect mix of balance/sturdiness along with excellent maneuverability for an easy, fun ride.